This half term took us back to Heaton Park, in North Manchester. We first visited two years ago, for a geocaching day out, and whilst there, an old man, gave the girls a few monkey nuts. 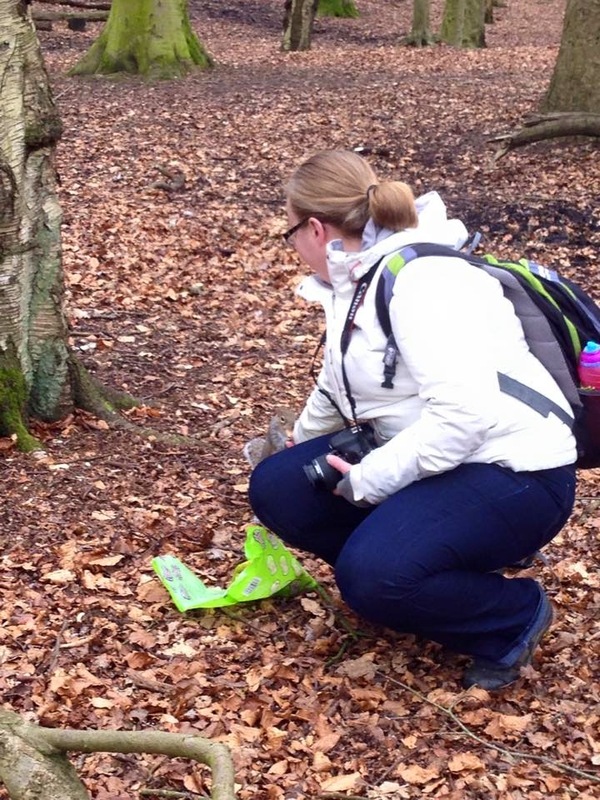 This memory has always stuck, as I have never found squirrels anywhere else as friendly. So, when I saw Monkey Nuts very cheap in Aldi, I knew it would be on the agenda for this half term week, especially as we had not been back since. We planned to meet with a friend and her boys, for some great outdoor fun. 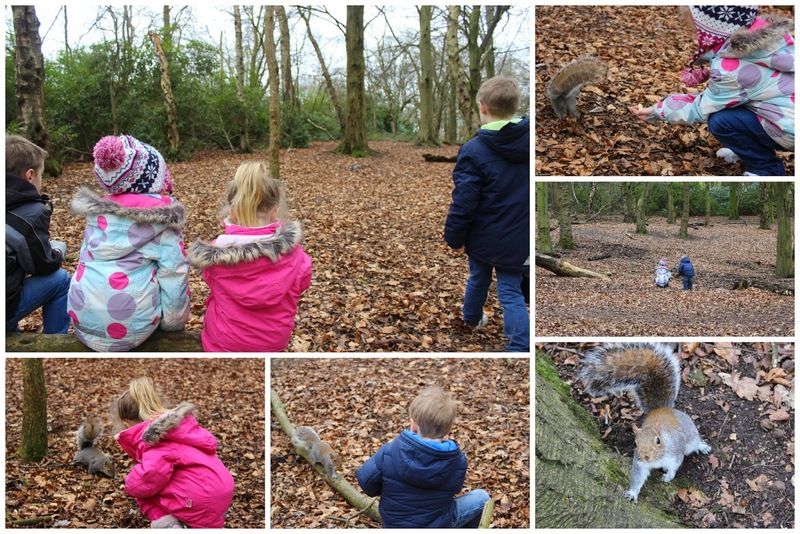 Our first port of call was to find the squirrels, so we headed to the woods. The boys were much more adventurous then my girlies, but J was keen to learn... O here is pretending to be a monkey, and J later in the day copied the same pose.... at first the squirrels were no where to be seen, so we just let them continue exploring the woods. After a few throws of the nuts into empty spaces, the squirrels came out of hiding. All the children went armed with nuts, and went chasing them.... no matter how many times we mentioned, if you run at them, they will run, they still continued the chase. They came and sat on a log nearby, and within a minute or two, they were all feeding them. JW was a little worried of being bitten, so dropped the nuts as it came close, but all the children were happy, at this rare half term activity. Even the boys mum wanted in on the feeding action, but with O next to her, she didn't have a chance, as all the squirrels seemed to of preferred him. It easily passed an hour, and none of the children were bored before we ran out of the two bags of nuts. Well worth the £1.50 in total. We would recommend it too. We then went off to explore the rest of the park. There were lots of paths, and as we weren't rushed for time, we let the children decide on the route we would take, with the majority vote. The path they chose, took us along some very tame horses, which J was very happy about. They had a fairground setting up on the field, and all the children wanted to go and explore. Thankfully for mummy's purse, the fair wasn't open. Conveniently placed by the lake was the ice cream van. The temperature was a little warmer then it had been the past few weeks, so yes, of course we couldn't just pass by. I was good, and didnt have my own, the calories from the licks to stop the drips from the girlies don't count, do they? S loved making a mess, purposely putting it on her nose, and giggling. We were then heading back to the car park, ready for J's appointment at the hospital for an eye test. (Turns out she DOES need glasses now), but before we did, we stopped by the animal farm. I have never seen goats so friendly. They were actually after strokes rather then food. And of course a quick stop by the park. This was my favourite day of the half term week so far. There is something about lots of smiling kids, giggling and enjoying all nature has to offer. Have you ever fed a squirrel out of your hand?? I'm buying some monkey nuts this weekend! We have so many squirrels in our garden and inspired by your post I definitely need to get my kids to see if they can feed them too. I love that you met so many friendly animals on your day out, it's not often you can. I love the idea of buying monkey nuts to feed the squirrels, I bet the squirrels didn't want you to leave. The girls look like they're having a fab time exploring the woods and learning from the boys that it's okay to be adventurous at times. Thanks for linking up with Country Kids. We don't get many squirrels on our local park as it is right next to the main road, but we see a couple ! Will be getting some Monkey nuts ready for the summer holidays though!